One of the points that I mentioned in the article entitled Analyzing Your Performance in the Competition section of this web site was the suggestion that you get into the habit of recording your own score while you are shooting for record. In that article I pointed out that keeping your own score can have several benefits, not the least of which is having a written record of how well you shot. Reviewing your score on a shot-by-shot basis can help you to find ways to improve your performance, identify trouble spots with your load or lube, or see when you may have made an error in judgement — for example, by cleaning your barrel during your relay because you thought the barrel was fouling too much, when in fact leaving it alone might have been a better choice. I just did this very thing at the NRA's Regional Long Range Championships at Camp Perry on July 10-11, 2004. It resulted in a miss and cost me 10 points on the last relay at 1,000 yards and a possible top three finish! To help you with this task, we have included an exceptional set of Firing Line Scoring forms that were designed by Cliff Gregg, an excellent long range shooter and top competitor based in southern Wisconsin. Cliff was kind enough to submit the forms that he developed to share with shooters visiting our web site. As you'll be able to see when you download them, Cliff's forms have been beautifully done and contain a whole host of critical information that you can record during your time on the firing line and then review afterwards to identify factors that may have helped or hurt you during your match. Cliff has designed forms for 300, 500, 600, 800, 900, and 1,000 yard events. 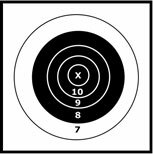 Cliff has also included a document called Target Dimensions which gives the dimensions of the scoring rings in the targets at the various ranges. Cliff has also provided a couple of forms that you may want to start using when you develop your loads and prepare for your matches. One is called the Load Work-Up Sheet . Another is called the BPCR Match Plan . Take a look at these wonderful forms and use them to improve your match performance. Both George and I would like to thank Cliff for his generosity in making these forms available to other shooters.